A (slightly belated) happy new year to all our members and supporters! 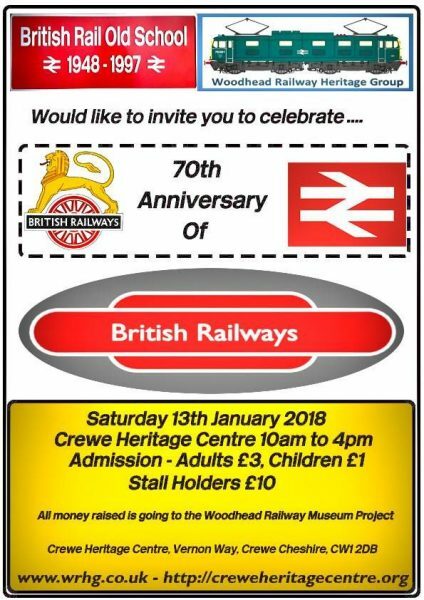 The first event of the 2018 calendar is the 70th Anniversary of British Railways event taking place on 13th January at Crewe Heritage Centre. This event has been organised by the Woodhead Railway Heritage Group to commemorate the anniversary of the railways’ nationalisation on 1st January 1948. The Friends of the 502 Group will be one of many organisations represented at the event, and of course all the Heritage Centre’s regular attractions will be on view as well. The Heritage Centre is located on Vernon Way, Crewe, CW1 2DB. It is just a short walk from Crewe railway station. It is open from 10am to 4pm and admission is just £3 for adults and £1 for children. There are no comments on this blog entry.